These leather look panelled trousers from our own label are versatile, flattering and effortlessly cool. 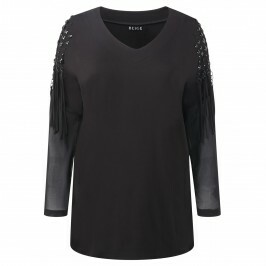 We’ll be wearing ours with a silky tunic and ankle boots for a seriously stylish evening look. Black leather look panelled trousers. Pull on. 77% Polyester, 20% Viscose, 3% Elastane. Pleather panels: 50% Polyester, 50% Polyurethane. Delicate Machine Wash.